I can't find a good graph for river height at Rufus. Upon reviewing past history of the graph I previously submitted I don't think it is a good indicator. 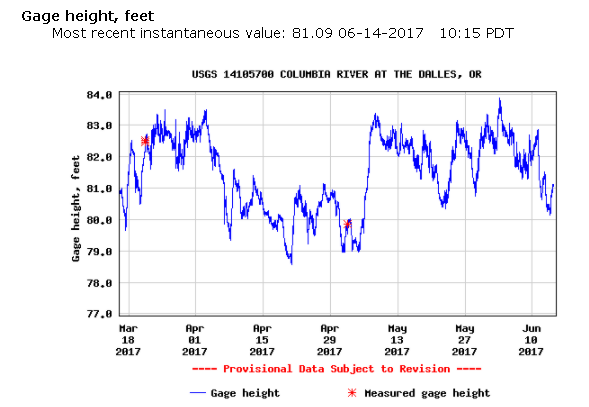 The best indicator I can find is river height below The Dalles Dam. As can be seen from the below graph the river is over 2 feet lower than it has been in previous months. I think it is possible that when the river is higher that you may not be able to touch as you are attempting to walk up the shoreline next to the brush. Which could be dangerous. Be sure to plan for a backup solution. Wed Jun 14, 17 1:17 pm DANGER !!! Good job bigjohn on the rescue and posting up the great information. I would like to share again one of the scariest kite mares witnessed in the past 25 years. A few years ago, Jason W. from Big Winds and I were trying to help a strong fellow kiter that had landed on the island just west of Rufus proper. Early summer-time river current was flowing. We were standing on the furthest west point of Rufus and the kiter in need of help was standing on the island to the west and closest to us. 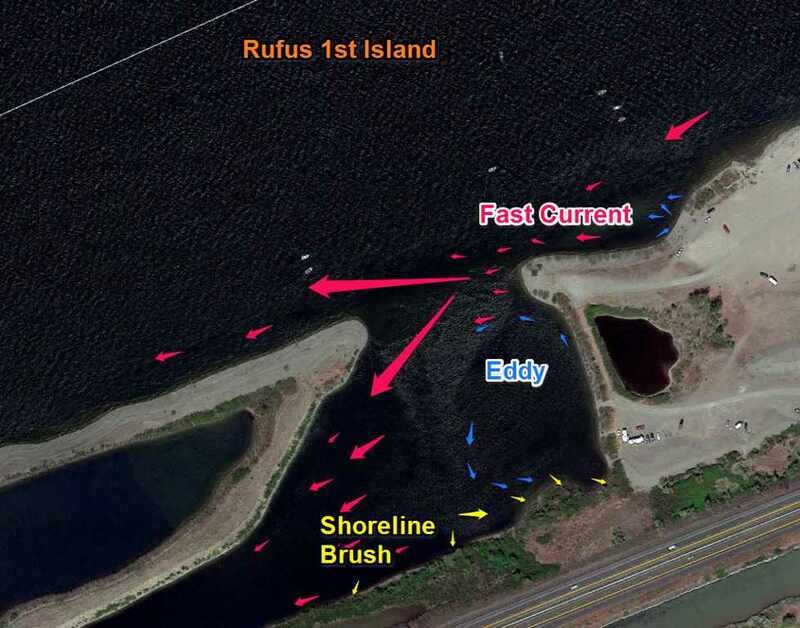 The kiter pulled the release on the kite and it fell gently into the water in-between the island and Rufus, right about at the tails of the large red arrows in bigjohn�s diagrams. The lines were slack and all of a sudden, the fully inflated kite was sucked under water. Completely. Gone out of sight with only the lines coming up out of the water. We all took a step backwards away from the water�s edge, waiting for some evil demon to burst from the murky depths with the kite in its mouth. About 5 seconds later the kite popped back up and drifted slowly east where we were able to retrieve it. The kiter, then realized that the best way back to Rufus, was to walk west and south on the island for 100 yards, then swim south across to the freeway, then walk back along the freeway to Rufus. Please under no circumstances try to swim directly between the island and Rufus. The eddy that exists is arguably one of the largest on the planet. Thanks for the link. I have book marked it for future use. Thanks for the info, everyone. I did not know about that eddy Glad to bump this thread as well. Hope to hit it this weekend! I took into consideration what Luke said. Also, decided to add some different perspectives (an overview perspective as well as a different angle at Island 1). Plus I resized my oversize photos to fit. I figured I would put everything on one post for clarity. Not sure if I have an answer for the best way to cross the islands but I think it is important to at least know what's below you if you are in the situation where you have to cross. In high water I think a person might be able to climb the steep rock face to the highway, but be prepared for a touch climb. Especially if you are attempting to haul gear. In looking at my own pictures I realized there is probably a 2nd Eddy in the area Luke was describing. Looks like a good possibility for an out. Thu Jun 15, 17 5:58 am The board was got, right? I left the board right at red marker. I was considering trying to get it, but I'm glad I didn't. That current and eddy are a mean machine. "Clear a space for some serious miracles and tacos"
Thu Jun 15, 17 6:15 am Re: The board was got, right? I went down to retrieve the board, but instead attempted to help a fellow kiter. The board got moved to the tip of Island1. After the other kiter was safe across to Rufus I attempted to take the board and other gear back to rufus, but felt I was beyond my skill level. Just getting on your board in that wicked current is challenge enough. Attempting to control another board was too much for me. I probably could have walked down the island a bit to a less difficult area but by this time I was the only kiter left and the wind was a bit flukie. I dropped the board owner's kite off (he is a neighbor) as yet another fellow kiter had retrieved his kite and given to me. The board owner retrieved his own board and the other kiter's kite the next day. All in all everything worked out. Everybody is well, and everybody got their gear back. Rinse and Repeat!!!! Kiters looking out for kiters! Thu Jun 15, 17 8:04 am Yup, yup, for sure. Eyes wide open. When I grabbed his board I was having trouble keeping my little 6 powered. I was being really careful to not drop my kite, no droppy kitey, is what I was thinking. Drop your kite and it's just too much going on in that strong current. I'm glad that you were able to help another kiter. I do like the idea of having an extra leash on the back of the harness to pull with. As long as everything goes as planned and the person behind you knows what to do. Thu Jun 15, 17 8:23 am Re: The board was got, right? Solid effort in safety as always John! One of the kiters you assisted is in town working with me on a project so we thankfully recapped/laughed about his experience and how his Gorge kite initiation has officially started when Big John is dragging you out at Rufus. Beers and steak on us up at the house soon. Thu Jun 15, 17 8:52 am Re: The board was got, right? I'm always up for a good BBQ!!! Anyway, if you find yourself in trouble between the island and Interstate, don't fret. 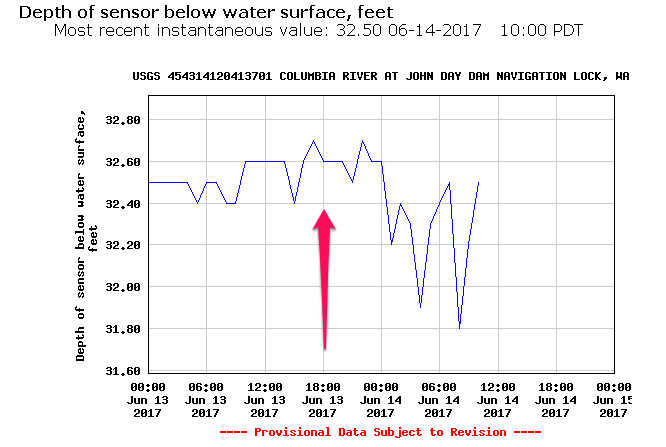 The current slows a lot and there's a shallow bar between the Interstate and island, humm, 3, I think. I was back there on a Waverunner a few weeks back looking for something (when it was really, really high and flowing) and even then, all is not lost if you find yourself back there. Wouldn't want to be there, but not the end of the world. If anyone ever has a problem down there, but is not in danger, give me a call and I will try and get down there with my Waverunner if I'm around (lost board, stuck on the island and don't want to make the swim, good beer that you can't finish, etc. PM for my number if you want). It might take an hour, but I'm happy to help out if I can. If I ever become Rufus worthy (kiting), then I'll always have a Waverunner there (but that may take years at the rate I'm going). A good investment, by the way. However, if someone is in trouble, call the Sherman County SO (541) 565-3622 (or 911, but if during weekday business hours, you might try calling the SO direct). If not on the John Day, the SO's boat is stored in Rufus, so response will be considerably quicker (again, if life or limb is at risk, not for a lost board). Sat Jul 01, 17 2:25 pm Re: The board was got, right? THANKS AGAIN FOR THE RESCUE JOHN! A few rescues yesterday. Lost my kite, board at the wall. Windsurfer stopped my board until I swam up. Thanks, bud! Swam to Islands and fisherman ferried me back to Rufus. Long, long swim. Learned to check both ends of safety leash, obviously my clip in on the back of harness was not secure. Kite drifted in to rocks on WA side and saved by Windsurfing kiters from Ottawa. Thanks friends! No real danger but pace yourself and don't panic. It might take an hour, but you will make it.